Goldilocks was hungry. She tasted the porridge from the first bowl. So, she tasted the last bowl of porridge. “Ahhh, this porridge is just right,” she said happily, and she ate it all up. “Too hot” and “too cold” are comparative extremes for most of us when it comes to many different things and, like for Goldilocks, “just right” may be relative to personal preference (or taste). In recent years, this notion has gained increasing relevance with respect to guidelines for emergency plumbing fixtures like showers and eyewashes. The latest American National Standard Institute (ANSI Z358.1-2014 “Emergency Eyewash and Shower Equipment”) guideline outlines the specific requirements for emergency eyewash and shower equipment, installation, testing, performance, maintenance, training, and use, and is referenced in most plumbing codes for compliance. One of the requirements of ANSI Z358.1 states that the temperature of the water discharged from the fixture should be “tepid,” or tempered within a safe range (aka, “just right”). However, “just right” is a relative term – not just for comfort, but also for the safety of the individual using the emergency fixture. 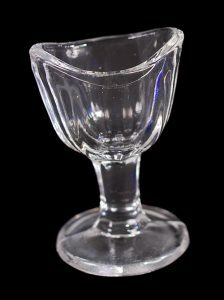 Dating from the 1920s, the Clear-Glass 8-Panel Eye-Wash-Cup glass appears to be one of the earliest uses of an eye-washing device. What looks like an oblong shot glass was manually filled with clean water and inverted over the eye for the purpose of flushing out whatever contaminants were present. It wasn’t until 1970 that the Occupational Health and Safety Administration (OSHA) came along to require safety standards for workers with 29 CFR 1910. Chapter 151c. states, “Where the eyes or body of any person may be exposed to injurious corrosive materials, suitable facilities for quick drenching or flushing of the eyes and body shall be provided within the work area for immediate emergency use.” Starting in 1981, and continuing with revisions in 1990, 1998 and 2004, ANSI Standard Z358.1 was developed and refined. It wasn’t until the 1998 revision that tepid water was introduced into the standard; 2004 that ANSI further clarified tepid water standards; and 2009 when they identified a specific temperature range. As defined by the ANSI Z358.1-2014 standard, tempered (or “tepid”) water is “A flushing fluid temperature conducive to promoting a minimum 15-minute irrigation period. A suitable range is 16-38 degC (60-100 degF).” Many Material Safety Data (MSD) documents specify at least a thorough 15-minute rinse to avoid prolonged exposure to injurious contaminants. When emergency shower drench or eyewash water is outside of the required temperature range, an injured worker is less likely to remain in the flow for the mandated full 15-minute wash cycle. Beyond discomfort, wash water that is too hot may cause scalding of the skin, opening of the pores, and result in increased absorption of contaminants through the skin or damage to delicate eye tissue. Wash water that is too cold may expose the worker to hypothermia or the natural reaction to quickly step away from the cold water. Some water temperatures are likely to trigger or accelerate harmful chemical reactions of certain contaminants, so it is best to consult a medical advisor or Material Safety Data for any necessary precautions in consideration of specific emergency hazard procedures. Cold domestic water from natural or municipal sources can range in average temperature from 75 degF to below 40 degF, depending on your location. In regions where the cold water temperature is below the tepid range, it is necessary to incorporate an adjustable thermostatic mixing device (valve) to blend heated potable water from a ready source to supply a steady flow of water at a constant safe temperature. Thermostatic Mixing Valves (TMVs), which are specifically designed for use with emergency fixtures, are an option. They are compliant with the ANSI Z358.1 standard and include safety options such as a cold-water pass-through (bypass) in the event that the hot water source is interrupted, or will shut down the valve completely in the event of a cold-water failure to prevent scalding. It is important to note that a source of heated water must be readily available for immediate use and must incorporate enough storage to allow at least 15 minutes of continuous flow. Storage capacity and recovery time for the water heater to replenish the hot water storage should be considered in case there are requirements for extended use or an additional 15-minute wash cycle. In applications where a dedicated hot water supply is unavailable, there are packaged tempering system alternatives that include a water heater, expansion tank, TMV, and recirculation pump that provides a continuous loop of tepid water for use with multiple emergency fixtures installed throughout a facility. This type of system saves the cost of installing a TMV at every fixture, with dedicated hot and cold-water piping runouts to each fixture. By today’s standards, it is not enough to have your eye-wash glass from the 1920s handy in case you get sulfuric acid sprayed in your face! And a cold shower should be reserved for other uses as necessary, but not after you have been doused with a harmful chemical contaminant. You need to have emergency shower and eyewash equipment that is fully compliant with the applicable plumbing codes that reference the ANSI Z358.1 standard. Check with your local code enforcement office and the official ANSI standard documentation for full interpretation and description of all requirements of the standard. What is a Trap Primer – And Why is it Required?